Fans of electric cars rejoice, another EV has hit the market. The smart Electric Drive (or “ED”) represents the electrification of smart’s popular ‘fortwo’ city sweeper. Only now, in place of a gasoline engine, there’s a 55-kilowatt (73hp) electric motor co-developed by Daimler and Bosch. 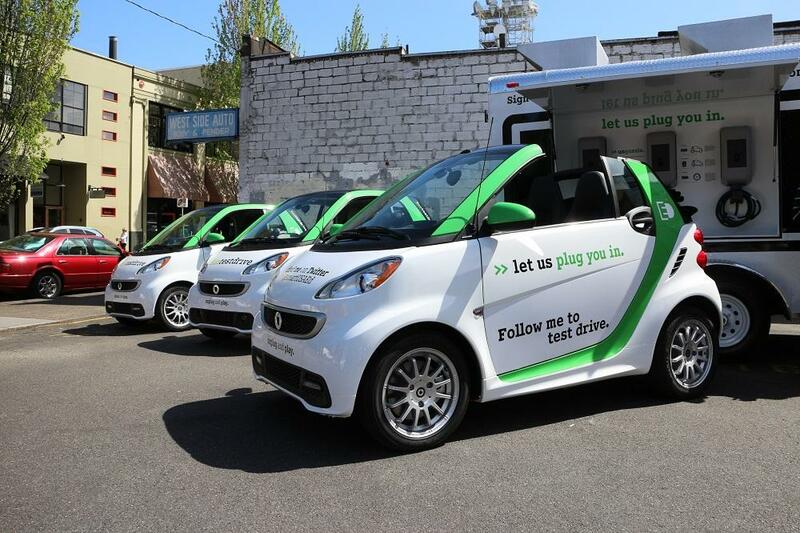 I recently had a chance to take the smart ED on a brief spin through the streets of Portland, Oregon and found that for a car labeled as smart, the ED sure makes a lot of sense. Let’s start with the electric motor and battery since those are the biggest additions to the smart ED. Because this is essentially an exact replica of the gasoline version inside and out, I was curious as to where Daimler would fit 17.6 kWh lithium-ion battery. Thankfully, it sits right between the rear wheels and doesn’t diminish any cargo or passenger space, a rare trait indeed when gasoline-powered cars get an EV overhaul. As for the electric motor, it’s capable of churning out 35 kilowatts of continuous power. The smart ED also features a kickdown mode, where the motor pumps out 55 kilowatts for up to a two-minute burst. According to smart, the ED can sprint from zero to 60 mph in less than 12 seconds, but I wasn’t able to verify this during my drive on city streets. And because the smart ED sports a single speed transmission, there is no need for shifting, simply put the car in drive and go. Looking at the numbers, the electric motor churns out 96 pound-feet of torque and 76 horsepower during those two minute bursts. Top speed is rated at 78 mph but my drive route prevented me from truly mashing down on the pedal. While I wasn’t able to put it through its paces entirely, I did manage to escape the confines of Smart’s predetermined drive route, heading just behind downtown to Portland’s maze-like West Hills. Most people assume that EVs suffer when it comes to performance and handling but that’s not always the case and I didn’t feel that way at all while driving the Smart ED. Acceleration was smooth and perky thanks to the instant torque on hand that all EVs seem to possess. And there was a real sense of speed (albeit a brief one) when shooting out of standstill. Perhaps what I like best about the ED and by extension smart cars in general is that feeling of being behind the wheel of a go-kart. Handling is lively and the little EV had no problem keeping its wheels planted during sharp corners. Whizzing and weaving by other cars, trucks, and Portland’s abundance of cyclists was made even more pleasing knowing I wasn’t using any gasoline or contributing any carbon emissions. Size doesn’t always matter, but where the Smart’s, uh… shortcomings were most evident was how poorly it tackled uneven roads. On smoother surfaces the Smart EV is buttery, on bumpier roads its small frame soaks up imperfections like a greased-up mop. Lithium-ion batteries are the go-to variety for automakers for a number of reasons: they charge faster, they perform better, and they typically last longer than other types, so it’s no surprise smart uses them in the electrified fortwo. 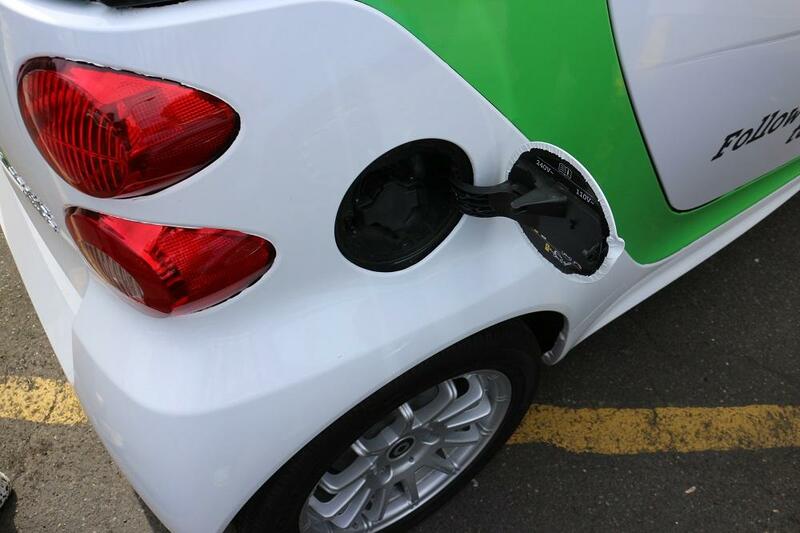 Smart says the ED’s battery is capable of grabbing 122 city MPGe (miles per gallon equivalent). The EPA has rated the EVs total range at 76 miles during city driving, however, smart is adamant that 90 miles is just as realistic depending on driving conditions (and your right foot). Like the Mitsubishi i and Fiat 500e, the Smart ED employs a regenerative braking system that captures energy lost during braking and channels it right back to the battery in order to replenish its charge. Using the car’s momentum, the electric motor acts like a generator, slowing down the car and sending 30 kilowatts back into the battery. While some regenerative braking systems have a tendency to feel intrusive – either by stifling acceleration and jerking the car back uncomfortably – the smart EDs goes almost unnoticed. Of course, charging times are just as important as total range. 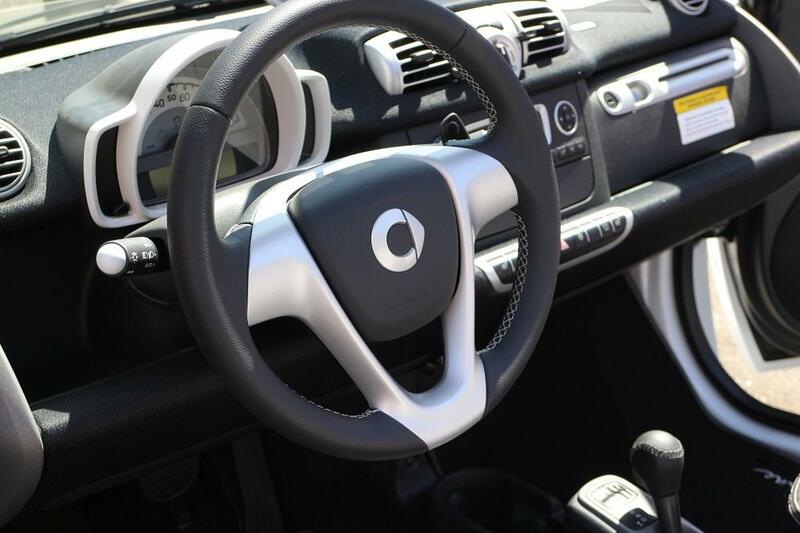 The fortwo electric offers two methods of charging: either through a standard Level 1 110-volt household socket or a 240-volt Level 2 outlet. Again I couldn’t verify charging times but Smart says it will take six hours using a Level 2 outlet and more than double that with a Level 1. Inside the Smart ED feels surprisingly spacious. As I mentioned earlier, the interior doesn’t suffer because of the battery placement nor did I ever feel like I was driving inside a giant sardine can. Of course the smart – regardless of its drivetrain – won’t accommodate larger hauls, meaning a couple of grocery bags (organic, right?) are just about all it will carry. As for the interior’s design, it’s decidedly low on excitement. Some would describe it as minimal with others would say sterile. Both are correct but I prefer meeting somewhere in the middle. Like the smart fortwo’s exterior, which looks like a caricature of larger cars on the road, the interior is wrought with wide, exaggerated panels, thick strips of material, and goofy gauges. It won’t be everyone’s cup of tea but it works in the confines of what the smart fortwo is: an eccentric city car for people that don’t want or need a “traditional” set of wheels and are not driven by their ego. I didn’t get much of chancee to fiddle with the electric fortwo’s navigation or onboard tech but potential buyers will be pleased to know it’s all there. A 6.5-inch touchscreen sits flush atop the dash and center console, which leads me to wonder why Fiat couldn’t have done the same thing with their 500e. The touchscreen is included in the smart highline sound system and provides GPS along with hands-free Bluetooth. In addition to hands-free calling, the smart ED also offers Bluetooth audio streaming as well as support for iPod/USB connections. There is even support for an SD card that allows videos and photos to be displayed directly through the touchscreen. While the electric Fourtwo is already a unique car in its own right, Smart is making sure customers have plenty of options available to personalize them even further. Because of the modular panels that make up the Smart’s exterior, drivers can swap different colors in and out; create their own decals, and even design their own wraps. Smart says the options are near limitless and it sure seems that way. 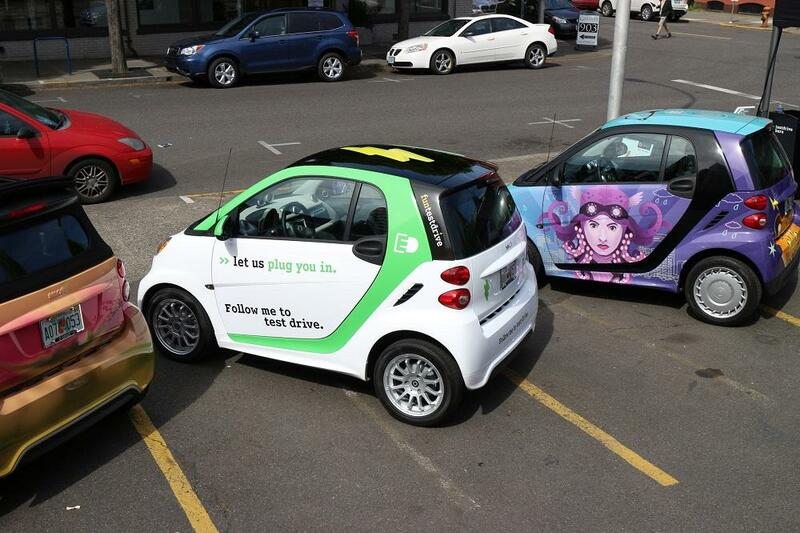 What’s more, the smart ED is the only convertible electric car on the market. The cabriolet features a fully automatic soft top that retracts at any (reasonable) speed. Of course, affordability is always going to be a concern with electrified vehicles, which is why smart is undoubtedly proud it can tout its all-electric fortwo as the most affordable EV on the market. The smart electric coupe retails for $25,000 while the cabriolet starts at $28,000, excluding federal and local tax incentives. While the Smart ED might not possess the range of a Tesla Model S or the interior appointments of a Nissan Leaf, for those lifestyles that it does accommodate, it’s shaping up to be quite the compelling option. Indeed, I just loved how fun it was to drive and even venturing outside the confines of the city didn’t seem to matter much for this little electric car.